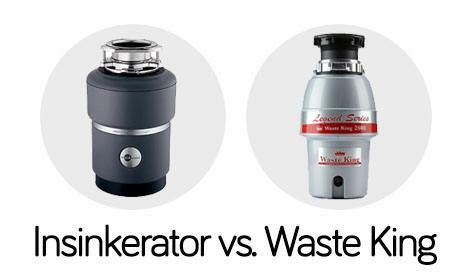 » Waste King Vs Insinkerator – Comparison of Two Best Garbage Disposal Brands. Which One Wins? Waste King Vs Insinkerator – Comparison of Two Best Garbage Disposal Brands. Which One Wins? Waste King vs Insinkerator, the battle over performance and premium brand value is quite old and common. I’ve seen users with different preferences over both garbage disposal brands. But it’s clear that these are the top two brands you can consider while buying a new disposal unit. Waste King or Insinkerator? Which one is the best? It ultimately depends on your needs. Both of these disposals have varieties of models with the latest features. Both can fulfill the needs of a modern home kitchen. The one that you are going to choose, needs to meet all the requirements that are a must for your kitchen. Insinkerator has two lines of disposals, Badger & Evolution series. 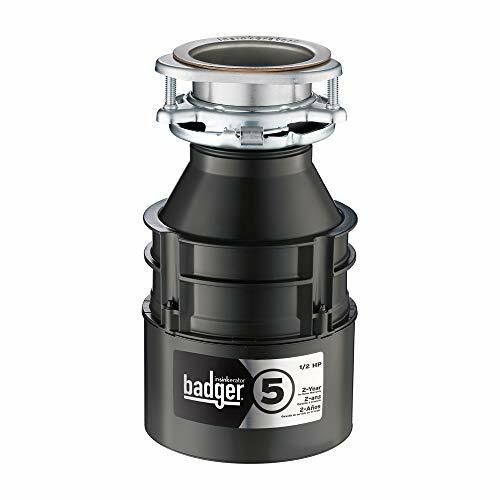 Most of us know the name Badger as the model is a classic from Insinkerator and appears in the market from the start of garbage disposal history. The Evolution series is more like a renovated, modern and fully featured version of the old garbage disposals. Besides all the Evolution models Insinkerator also has a disposal that is specially designed for homes with a Septic system. On the other hand, Waste King contains two types of product range, containing EZ Mount System & 3 Bolt Mount System. The EZ – Mount disposals are more modern and easier to install. Waste King has disposals of different power and price range. Not much difference in this area. Both disposals have powerful motors with high capability of grinding kitchen waste. You need to choose a disposal unit according to its power depending on your need for usage. More powerful units are capable of dealing with more wastage on a frequent basis. When we are talking about Insinkerator vs Wasteking, the most noticeable difference between these two disposal brands is the pricing. Waste King costs much less than an Insinkerator garbage disposal. Compared to Insinkerator models, Waste King disposals come with a motor that operates at higher RPMs and a longer period of warranty. 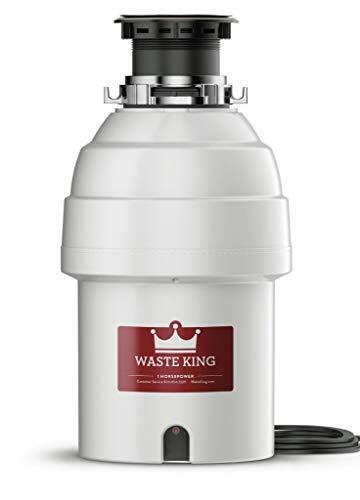 For budget purchase, Waste King is an excellent option over Insinkerator. Waste King is going to provide great value for money on the disposal units compared to the other best garbage disposal brands. The Insinkerator Evolution series brings you the latest technologies of grinding garbage inside a disposal unit. The new models contain more than one grinding stages. Once your disposal grinds the waste and puts it inside another filter to grind it again, there is a lesser chance of having chunks leftovers. If the waste is not tiny enough to go through the pipeline, it can get stuck inside and ultimately block your drainage system. The multiple grinding option is a very smart and useful addition from Evolution series. Waste King has no such technology. You have a smaller space under your sink. What should you choose? Waste King or Insinkerator? I’ll say go for Insinkerator. 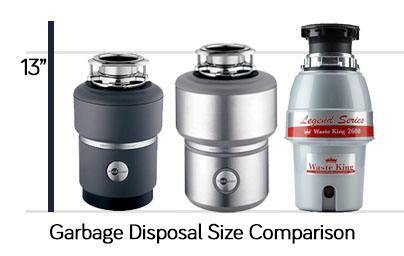 Insinkerator disposals are more compact in size than Waste King disposals. An Insinkerator can easily fit within the space under your sink. 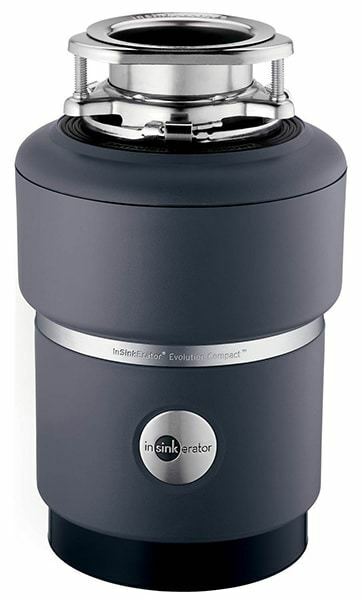 Insinkerator Evolution Compact is just the perfect unit if you are concerned about size. Of course, a compatible size is always a better option while you are choosing a kitchen gadget. If the bottom area of your kitchen sink is congested; then it is a must to choose a small size disposal unit. On the other hand, Waste King’s different models are similar in size. As the size is big, it holds more grinding space in it, which is also a positive factor for the Waste King. Which one is less noisy? The newer models of both garbage disposals are not very loud. The old badger disposals were very noisy and quite irritating. The Waste King disposals also make noise while grinding, but most of the users say it’s tolerable. Now, if you are looking for a very quiet disposal, then you must go with the Insinkerator’s new evolution models. The sound is just a light humming compared to the old models. The sound seal technology of Insinkerator works much efficiently than the Waste King. Waste King’s sound insulation technology is nothing but a thick foam wrapped inside the unit. So, in this Waste King vs Insinkerator battle, Insinkerator wins without any doubt in terms of making least noise. Who wins the warranty battle? Of course, Waste King wins the warranty battle. Who can win over a lifetime warranty? Insinkerator’s highest warranty covers up to 7 years, where all of the high-end Waste King disposals come with a lifetime warranty. The consumers of both the brands have more or less good experience over warranty & support service. But the Waste King users are more comfortable with the longer warranty period. Power cord included or not? Another very usual complain about Insinkerator is that it does not include the power cord. So you need to buy the power cord spending ten more bucks out of your pocket and install it with the disposal unit. It is not very hard to install; the kit is easy enough to setup by yourself. Many consumers prefer the pre-installed power cord as a more convenient option. This is the point where I prefer Waste King. All the Waste King disposals come with a pre-installed power cord. As for my personal opinion (and many others), Insinkerator garbage disposals are made with better-quality material than Waste Kings. The body of Waste King disposals are made of plastic, as well as the mounting flange neck. On the other hand, all the Insinkerators have a strong metal mounting flange. Both disposals are good to go with the built but Inskinkerator’s built is stronger than Waste King’s disposals. Last month when my disposal got stuck, I had a hard time to reach the reset button on my Insinkerator Evolution Compact. It’s on the bottom side of the disposal unit. The reset button is needed whenever your garbage disposal is stuck or jammed for this type of emergency. It’s always better to have the reset in front of the disposal unit, somewhere your hand can easily reach. The reset button of the Waste King disposal is located in a suitable place that you can easily find and reach. Many users complain that the Waste King disposal’s splash guard has a bad design. It prevents the water to drain fast. The small hole and tightrubber prevents to move water quickly when you work with full water flow. To solve this problem, I suggest you cut the rubber sides a bit, so it gets a bit more space to grab water quickly. On the other hand, Insinkerator’s splash guard is well designed and easier to work with full water flow. Insinkerator charges a premium price, is it worth the money? Waste King or Insinkerator? I have faced this question a thousand times. But many also doubt about Insinkerator’s extra pricing compared to Waste King. Insinkerator will cost you extra bucks, but the disposals have strong making quality which ensures durability. Nothing to say about operation, it works like magic with your trash. These disposals will sit under your sink and eat things like a silent monster. 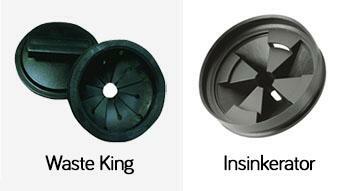 Insinkerator offers different types of disposals that fit in your home. All the disposals have a modern sleek design with a noise reduction technology. From Insinkerator, you get all that needs to be included in a modern garbage disposal unit. Not to mention, thousands of existing users of Insinkerator have a great experience when switching from their old badger to new evolution series disposals. Yes, I think the premium pricing of Insinkerator is worth the quality. As most of the Waste King disposals are cheaper than Insinkerator disposals, many users go for Waste King disposals, which I actually think is a very wise decision. Most of the high-end disposals of Waste King cost less than Insinkerator. All you get from Waste King is a good disposal that can grind your waste and gives you value for money. If you are a budget concern buyer, you should go with a Waste King disposal unit rather than Insinkerator. Because I personally feel like Waste King’s pricing is very competitive and gives you real value for money. If you have a higher budget and need heavy use of a disposal unit, go for Insinkerator. It will charge you premium but as well provide the premium service.